Stay on top of the ongoing iPhone virus warning popup fraud campaign and learn its technical background, objectives, and effective ways to address the issue. Numerous reports on the cyber threat landscape being released by security firms over the course of this year reiterate that perpetrators are increasingly focusing on compromising mobile devices. Whereas the bulk of these threats zero in on Android, some target iOS with tangible success. These incursions are a fusion of malware and social engineering for the most part. In the case of the latest campaign of that sort, infected iOS users keep getting obnoxious popups about viruses allegedly detected on their iPhone. The tip number one in this context is not to fall for such alerts as they are phony to the bone. The annoying popups are triggered by a rogue app or malicious script that infiltrated the mobile device without the user’s awareness. The culprit is most likely to have trespassed on the iPhone via trojanized downloads. It might have been an innocuous-looking free applet downloaded from a dubious resource. When on board, this offending entity modifies Safari settings and may also interfere with iOS configuration without displaying any authorization prompts. In the upshot, the web browser starts acting up by generating popups with predefined content. These nagging ads are part of a virtual layer stealthily added to all web pages that the unsuspecting user visits. Sometimes the iPhone virus popup is a well-camouflaged browser redirect instance. One way or another, it is a symptom of a medium-impact malicious script’s activity. Another facet of this security issue has to do with the misdemeanor of a booby-trapped application that was recently installed. By granting the requested permissions to uncertified apps, iPhone users run the risk of falling victim to the scam in question. The misbehaving program is configured to display popups at certain fixed intervals. 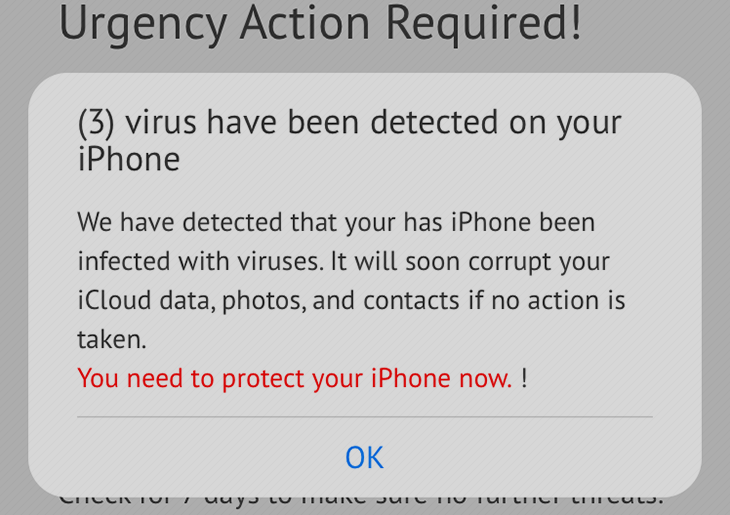 The fake warning popup messages are usually titled “Urgency Action Required!” and render the following notification, “Viruses have been detected on your iPhone. We have detected that your iPhone has been infected with viruses. It will soon corrupt your iCloud data, photos, and contacts if no action is taken. You need to protect your iPhone now.” The purported consequences listed there are, obviously, intended to instill more fear and put additional pressure on the victim. The main idea is to dupe the user into tapping the OK or Install button. Doing so will, in turn, install more malware onto the target iPhone instead of resolving any issues for real. Another possible outcome of following the rogue recommendations is a rerouting to phishing pages that request personally identifiable information. If you are experiencing problems with bogus iPhone virus popups, go ahead and use the walkthrough below to fix the issue. • As the menu expands, make sure the following options are checked: Clear browsing history, Clear cache and Clear cookies. Confirm before exiting. The popup and redirect activity should now stop in Chrome. Infections like the iPhone virus popup malware can infiltrate a device through unprotected connections. Logging into public Wi-Fi networks and visiting compromised sites may get the gadget exposed to malware and hacker attacks. It’s therefore strongly recommended to use automatic protection during web surfing.